Interactive map of 10 South America biomes. Geography learning game. 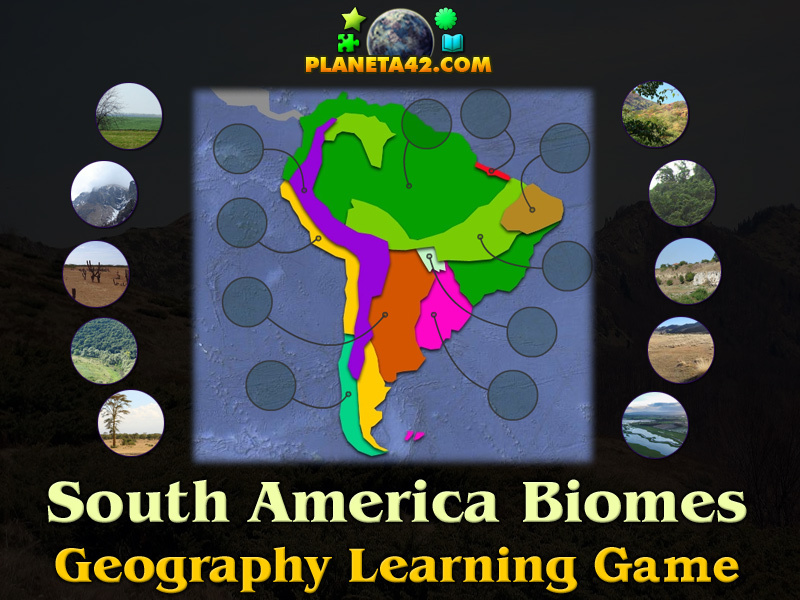 "South America Biomes Puzzle" is a free online knowledge level game to find the correct biome of South America habitats map. 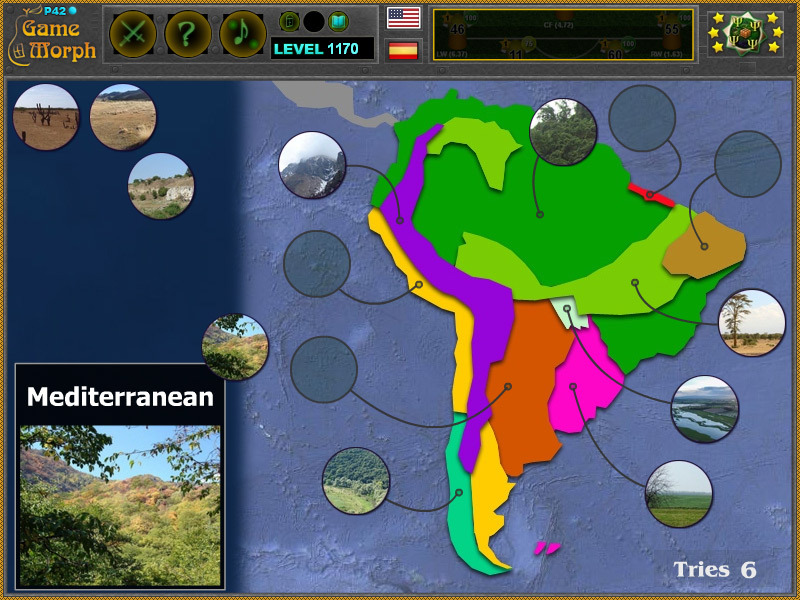 Fun educational geography game to exercise or study the habitable zones and terrestrial vegetation of South America, suitable for online lessons and interactive classes. Minute to win it game. Bimes game. How to play South America Biomes Puzzle. There are 10 movable pieces of South America biomes situated on the left side of the screen. Drag and drop them on the correct slot of south america terrestrial map to the right of the screen. The information window shows an awesome landscape of the biomes. Know 3 biomes of South America and get +1 Knowledge Level. Class subject: South America Biomes. The distribution of the average temperatures in the region presents a constant regularity from the 30°. In temperate latitudes, winters are milder and summers warmer than in North America. Because its most extensive part of the continent is located in the equatorial zone, the region has more areas of equatorial plains than any other region. The distribution of rainfall is related to the regime of winds and air masses. In most of the tropical region east of the Andes, winds blowing from the northeast, east and southeast carry moisture from the Atlantic, causing abundant rainfall. What environment zones do South America have? How many biomes are there in South America? What is the abundance of Savannas in South America? Where do jungles grows in South America? What are the biomes of South America? What habitats do South America have? Labels: Biome Games , Interactive Maps , Puzzle Games , Geography Games , South America Games , Free Online Games.